TFSA or RRSP - Which is better? TFSA or RRSP – Which is better? Canadian investors definitely have a conundrum when it comes to choosing between a TFSA or RRSP – which is actually better? or even which account do you start with first? Good questions and it’s a good problem to have as it means you are saving money – congrats on this achievement. Growing your money tax-free is a great way to accelerate your portfolio growth and more so if you invest with a long-term horizon. Like everyone else, I have also had the challenge of prioritizing which one to do first and also explain to my spouse why. 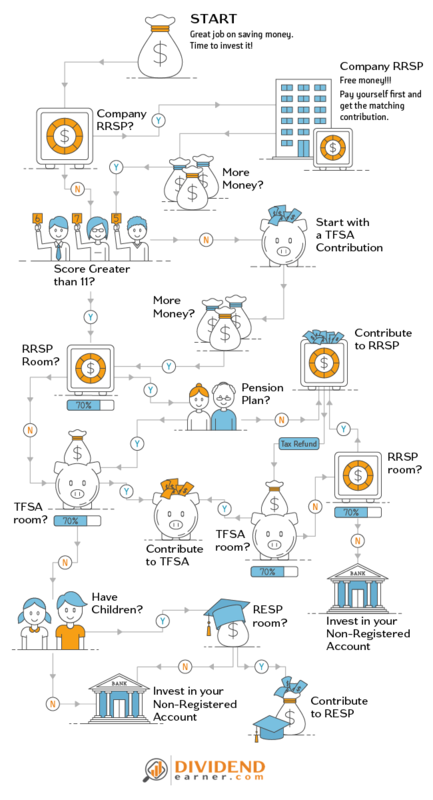 I have created an infographic to make it super simple but before we dive into it, let’s make sure we all have the same background on what a TFSA and RRSP actually are. Here are 3 statements for those wanting the results and not the why. Read further for the how and why. When in doubt, start with the TFSA. If you have a middle to low income, start with the TFSA. If you do start with an RRSP, put the refund in your TFSA. While we should strive to contribute to both investment accounts, choosing between the Tax-Free Savings Account (TFSA) or the Registered Retirement Savings Plan (RRSP) is often necessary. To make it simple and easy to digest, a table is presented to show a simple breakdown of each account. The short comparison is an easy comparison but not enough to establish a strategy for your investments. Both have tax-free growth so it all comes down to paying your taxes before or after. All the details well laid out for consumption. This is not a pro’s and con’s table but simply the rules of each account type. There are some details that can have a major impact at some point in life. Contribution Limit $5,500 per year after you are 18. Rules are subject to change. 18% of your gross income or the maximum of the year, whichever is lower. The maximum contribution is adjusted annually, be sure to double check every year. Contribution Carryover Unused contributions from previous years are carried over to the following year. Unused contributions from previous years are carried over to the following year. Contribution Room The total contribution room can be calculated as per the table below but you can also check with the CRA by accessing the ‘My Account’ service. See your tax statement as it reports your new RRSP contribution room after you file your taxes. You can also check with the CRA by accessing the ‘My Account’ service. Taxation No taxes within the account and no taxes on the withdrawal. No taxes within the account, however, withdrawals trigger a tax. A percentage is to be paid immediately while the withdrawal amount is reported as income. Your tax rate at withdrawal time defines the amount of taxes you will pay. Withdrawals You can withdraw any amounts and you are allowed to contribute it back starting the following year. Withdrawals trigger a taxation unless you are using the money towards the Home Buyer’s Plan (HBP) or the Lifelong Learning Plan (LLP). Each of those plans has their own repayment conditions. Unused Contributions Starting at the age of 18, your contributions start accumulating and is not lost. The unused contribution accumulates as long as you file your taxes to report your income. Spousal Contributions You can use your contribution room to make a contribution to your spouse account. This benefit can be a tax-efficient approach to managing your family’s RRSP. Income splitting is only supported through a Registered Retirement Income Fund (RRIF). Often times, the usage of the RRSP is deficient as the tax refund is not put back to work. See the impact of that missed opportunity on your portfolio – 4 scenarios are reviewed below. In fact, you may find that the most efficient is to borrow extra money for a couple of months to contribute in the current year as opposed to the following year. Quick Tax can help you figure out the maximum loan opportunity. I have personally borrowed from my line of credit to increase my contribution and then used the tax refund to pay it back. Avoid the RRSP loans if possible and simply use your line of credits – it’s a good use of a line of credits. TFSA vs RRSP – Which is better? What better way to see what works best than running the scenarios. Below are 4 scenarios to review before you evaluate which account to choose first; TFSA or RRSP. Below you have the details of a TFSA vs RRSP calculator. Your marginal tax rate today vs tomorrow is important for a TFSA vs RRSP calculator. The math says that if you are in the same tax bracket between when you invest and when you withdraw you will receive the same amount between using a TFSA or RRSP + tax refund back in your TFSA but as your tax bracket goes down in retirement investing in your RRSP and funnelling the tax return in your TFSA is the best. This is where thinking of your situation in the future can help cement your decision. What I find Illuminating is that that the RRSP + Tax Refund in TFSA does better than the other options. Just doing one or the other is not enough it seems and a balance is important. If you want to play with the numbers, WealthBar has some nice and easy to use calculators. One option not illustrated is using the tax refund towards your mortgage payments. It’s an interesting option for those wanting to eliminate their mortgage fast. I am not a fan of it as your home is not an income producing asset unless you have a suite. If you do make your own TFSA vs RRSP calculator, you can play with the tax rate in retirement as well which is generally much lower than in your high income earning years. Below are the annual contributions possible since the TFSA was introduced. In the year you turn 18, your TFSA contribution starts accumulating. A deficient approach to the TFSA is to use it for an emergency fund or short-term savings. Technically, an emergency fund should represent a cash holding which has literally no income potential in the current low-interest rate environment we are in and therefore relatively no income taxes to pay. If you cannot afford to contribute to your TFSA outside your emergency fund, then go for it and save a few bucks from taxes but the real benefit is to shelter investments. The TFSA should really have been called the Tax Free Investment Plan to avoid any confusions. Both, your TFSA and RRSP, should be part of your financial freedom plan and both accounts should be used to hold investments rather than cash for an emergency. However, the exception is using these accounts to build a down payment for a home is appropriate. Consider your spousal TFSA and RRSP as part of your overall family strategy. As a family, you have available contribution room for each TFSA and RRSP for both spouses. All you need to try is balance the RRSP amounts if you plan to withdraw prior to converting to a RRIF. The same process you use to prioritize your TFSA or RRSP should apply to your spousal account. 2 Steps Process – Start with a TFSA or RRSP? In a perfect world, you can maximize your contribution to both investment accounts but that is not usually the case. Considering all of our situations are different, it’s not trivial to provide guidance without knowing more about everyone’s individual or family situation. At some point in life, you will have to prioritize the TFSA or RRSP and that’s just fine. It goes without saying that a discount broker, such as Questrade, can provide all the needed flexibility in managing your accounts. Choosing a TFSA or RRSP is all about managing taxes today for tomorrow so understanding your situation today and also extrapolating in the future will help make the right decision. To simplify the identification of your personal situation, the below assessment is broken down into four sections with a value assigned to each answer that best describes your situation. By adding the points together, you get an overall value of your priority which is meant to take into consideration your income tax bracket and ability to save. Are you going down a path with a pension? Do you intend to own a business? Stay a blue color worker? Evolve to be a white color worker? For each of the sections below, pick the most appropriate answer and add the points together to use in step 2. Your employment status says a lot about your tax situation. Self-employed business owners are usually paying themselves a low salary for a low-income tax rate followed by a distribution of dividend from the company also at a lower tax rate. If you cannot save money, it will be hard to contribute to either a TFSA or RRSP. Your savings rate matters a lot in your ability to maximize your contributions. If you review the wealth triangle factors, you will notice that the amount of money you can save and put aside plays a big role in generating wealth. It should be no surprise that it plays a factor in deciding if you should invest in your TFSA or RRSP first. Below are the points assigned to your saving rate against your gross income. If you have it on auto-pilot, it should be very easy. Your income bracket also plays a key role as it identifies your potential tax refund. If you are a student making less than $8,000 (approximately), you start to generate RRSP contribution room but you don’t pay taxes at that rate. Since the biggest withdrawal attempt comes from making a down payment towards a home, it’s an important factor to take into consideration. You definitely need to plan the usage of the RRSP Home Buyer’s Plan (HBP) and see about making use of your RRSP. That money should not be invested in equity to avoid any market risks. Consider cash or fixed income depending on your timeline. Remember that you can always start with your TFSA and then move the money in your RRSP at a later time. Step 2 – TFSA or RRSP First? The infographic below makes it easy to choose your path and is based on your self-identified situation. Look at it as an initial guideline and adjust as you need based on the 2 tables above. Some points of reflection, I believe the TFSA should be used like an RRSP with a focus on building wealth for retirement. One important factor difficult to assess is the retirement strategy for withdrawal as it depends on the entire family situation and the actual amounts in each of the accounts. Your age also plays a role in the withdrawal strategy as you could withdraw from your RRSP only to funnel it inside a TFSA prior to OAS benefits to avoid clawback. There are basically 2 key ages that matter for tax planning; 65 and 71. One point to be aware of is that the maximum contributions have become quite high and they continue to increase. Consider that for a young adult, there may already be 4 to 6 years of unused TFSA room by the time they graduate university since it starts at the age of 18. At $5,500 per year, that gives a new university graduate an unused contribution room of $22K to $33K.